An online marketing certificate can prepare you for entry-level roles with above-average salaries. For example, the Bureau of Labor Statistics (BLS) estimates that advertising sales agents -- a popular position pursued by marketing certificate holders -- earned a median salary of $49,680 in 2017. This figure was nearly $12,000 more than the median salary in the U.S. in 2017. A marketing certificate can also serve as a stepping stone toward an undergraduate degree. Many schools allow you to apply credits earned during a certificate program to meet associate or bachelor's degree requirements. What Else Can I Expect From an Online Certificate in Marketing Program? 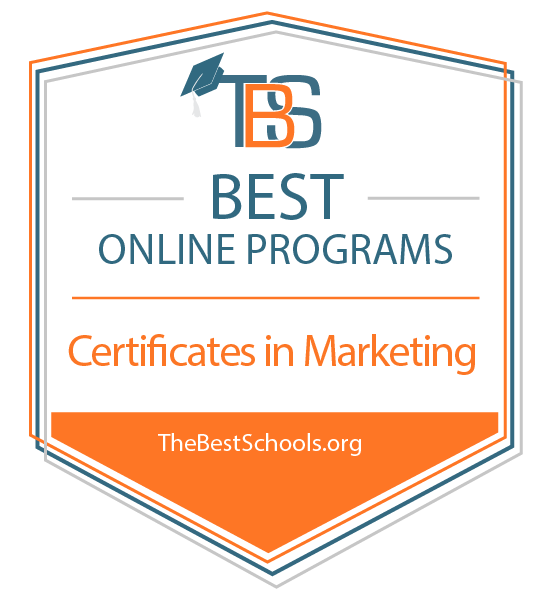 What Are the Best Online Certificate in Marketing Programs? Online Certificate in Marketing Degree Program Ranking Guidelines: We selected the degree programs based on the quality of program and range of courses provided, as well as school awards, rankings, and reputation. Based in Big Rapids, Michigan, Ferris serves more than 14,000 students annually. The school's distance education offerings include an online marketing certificate that emphasizes concepts and practical applications related to database-driven direct marketing. The certificate program explores direct marketing as both an overall business model and as an aspect of marketing communications, covering topics in planning, promotion, merchandising, fulfillment, and customer service. Other topics featured throughout the curriculum include strategic business planning, business-to-consumer offers, turnkey catalog operations, direct marketing math, and media planning. Certificate holders often pursue entry-level positions with advertising and marketing agencies or continue their studies to earn an associate or bachelor's degree. The certificate program uses a fully online, asynchronous format, meaning students can access their coursework any time of day through the school's online learning platform. Students must complete all required courses with a minimum 2.0 GPA in order to earn the certificate. Ferris is regionally accredited by the Higher Learning Commission (HLC). One of the seven members of the University of Maine System, UMM ranks among the smaller colleges in the state, enrolling around 800 students annually. The school hosts several distance education programs, including one of the best online marketing certificate programs in the state. The 18-credit certificate in marketing requires a total of six courses, including five core courses and one elective. The certificate core covers major topics in marketing and entrepreneurship, advertising, personal selling, consumer behavior, and marketing management. Students can choose one of three courses to fulfill the elective requirement: marketing channels, marketing for nonprofit organizations, or marketing research. UMM offers a special "Mainers in exile" tuition rate that allows former in-state students who reside outside of Maine to pay the in-state tuition rate. UMM is regionally accredited by the New England Association of Schools and Colleges (NEASC). Operating multiple campuses around Macomb County in Michigan, MCC offers several online options for marketing students, including a certificate in marketing and a skill specific e-marketing certificate. Marketing courses available at the college include business enterprise, small business marketing, sports and entertainment marketing, and professional selling, making the certificates widely applicable to an assortment of industries. Students who complete the marketing certificate program can apply their credits toward an associate degree in business management. MCC's articulation agreements with several four-year colleges throughout Michigan also make it possible to transfer credits toward a bachelor's in business, marketing, or a related field. Online students also receive support from the school's career services center, which can connect graduates to job and internship opportunities. MCC provides affordable tuition rates as well, with 80% of students graduating without any student debt. MCC is regionally accredited by the Higher Learning Commission (HLC). A major public college in Springfield, Missouri, OTC serves more than 15,000 students, with nearly half enrolled in at least one online course. The school's 30-credit online marketing certificate explores foundational topics in accounting, business, marketing, communications, and management. Students also select one elective course in a related area, such as microeconomics, advertising, or consumer psychology. Graduates of the certificate program often pursue entry-level work in retail, marketing, accounting, or management. Students may also apply their credits toward the school's 61-credit associate of applied science in business and marketing degree. Those who wish to transfer to a bachelor's program at a four-year college should contact outside institutions to determine their specific credit transfer requirements. OTC offers a variety of student services for online learners, including career employment services, writing tutoring, library resources, and testing services. OTC is regionally accredited by the Higher Learning Commission (HLC). Founded in 1946 as Maryland's first community college, HCC offers students one of the top marketing certificate programs online. The school's certificate in management marketing option requires a total of 18 credits, building foundational skills in marketing that students can apply to professional work or further academic study. The certificate includes six courses covering business communication, macroeconomic principles, information technology, principles of management, and marketing. The entire certificate curriculum uses a fully online format with an asynchronous delivery mode, enabling students to complete coursework at any time of day without ever visiting the school's Hagerstown campus. While the program requires no set login times, candidates must still meet deadlines for submitting assignments. Students who complete the certificate program can apply their credits toward HCC's associate in applied science in marketing degree. HCC is regionally accredited by the Middle States Commission on Higher Education (MSCHE). Serving more than 12,000 students each year, MCCC operates a main campus in Blue Bell, Pennsylvania along with a sizeable online program. The school's 30-credit online marketing certificate emphasizes communication skills and fundamental marketing concepts, with a curriculum designed for both working professionals and students new to the business world. Comprising a total of 10 courses, the certificate curriculum explores major topics such as ethical decision making in business, advertising and promotion, personal sales management, and digital marketing. Students can also complete an optional three-credit internship, performing supervised work in a professional marketing setting. The internship typically requires about 15 hours per week, and online learners can intern at local organizations in their own community. Those who complete the certificate can also apply their course credits toward MCCC's associate degree in management, which typically takes just one additional year to complete. MCCC is regionally accredited by the Middle States Commission on Higher Education (MSCHE). A member of the expansive North Carolina Community College System, PCC hosts a substantial distance program that offers online marketing courses with certificates. The college's business administration: marketing certificate builds foundational knowledge in marketing and retailing, training students to produce marketing plans, create advertisements, prepare sales presentations, and create product and logo designs. Students complete an 18-credit curriculum that includes six courses, covering the fundamentals of selling, marketing research, advertising and sales promotions, and office software applications. Ideal for working students, the program uses a fully online, asynchronous format that makes it easy to balance classwork with professional obligations. Marketing certificate candidates at PCC can join the school's chapter of DECA, a student organization focused on marketing and entrepreneurship. DECA members take advantage of professional support and development opportunities, joining a community of marketing students and businesses leaders. PCC is regionally accredited by the Southern Association of Colleges and Schools Commission on Colleges (SACSCOC). Through a partnership with the Salt River Pima-Maricopa Indian Community in Scottsdale, Arizona (just outside of Phoenix), SCC is the country's only public two-year college located on Native American land. The school serves more than 10,000 students annually through its on-campus and online programs, including a certificate of completion in marketing. Students pursuing this 18-credit digital marketing certificate online complete six courses, including five core courses and one elective. The program core explores fundamental topics in business and marketing through courses in the principles of sales, advertising principles, the principles of marketing, and computer usage and applications. Students can choose between several courses to fulfill the elective component, including human relations in business, marketing and social networking, merchandising, and introduction to public relations. Certificate holders often find work in retail, professional sales, entrepreneurship, and wholesaling. Many students also go on to complete SCC's associate of applied science in marketing and sales. SCC is regionally accredited by the Higher Learning Commission (HLC). A member of the Minnesota State Colleges and Universities System, DCTC offers technical and professional education through both its main campus in Rosemount and a distance education program that hosts one of the state's best online marketing certificate programs. The school's marketing communications specialist certificate explores the foundations of marketing and professional communications, training students in the strategies and tools used to reach consumers. The 28-credit curriculum includes a total of 10 courses, covering topics in public relations, digital marketing tools, marketing research, and marketing communications writing. Preparing graduates for professional success, the program includes a one-credit portfolio and interviewing course in which students compile a professional portfolio, develop interview skills, and hone their resume and cover letters. The certificate also feeds into DCTC's associate programs in marketing or business marketing specialist, each of which require an additional 32 credits. DCTC is regionally accredited by the Higher Learning Commission (HLC). A public college based in Trenton, New Jersey, TESU emphasizes self-directed learning, offering a substantial online program designed for working students. The school's 18-credit online marketing certificate offers a broad overview of the field in a fully online format. The program splits its curriculum evenly between three required core courses and three electives. The certificate core covers topics in marketing, market research, and marketing communications. Electives offer the chance to explore a variety of related topics, including advertising, channels of distribution, marketing management strategy, sales management, and principles of sales. All courses use an asynchronous format with no designated login times, which makes it easy for working students to complete coursework while maintaining a job. The certificate curriculum also segues seamlessly into TESU's bachelor of science in business administration in marketing, with all certificate credits counting toward the degree. TESU is regionally accredited by the Middle States Commission on Higher Education (MSCHE). Part of the Technical College System of Georgia, GPTC ranks among the top providers of technical and professional education in the state, serving students across four counties. The school boasts an over 99% job placement rate for its graduates. In addition to several on-campus marketing certificates, the college also offers an online diploma in marketing management. The 43-credit marketing diploma explores the field in depth, covering topics in advertising, marketing research, retailing, selling, and consumer behavior. The diploma offers three specialization options in entrepreneurship, marketing management, or retail operations, with nine credits dedicated to specialization courses. Students can also participate in an optional three-credit practicum or internship experience. The program takes most students 54 weeks to complete. Program graduates often find work in green marketing, sales management, and advertising and promotions management. GPTC is regionally accredited by the Southern Association of Colleges and Schools Commission on Colleges (SACSCOC). Located in Bloomington, Minnesota (a suburb of Minneapolis), Normandale enrolls more than 10,000 students annually. The school's online marketing certificate offers a general overview of marketing principles, either as an independent certificate or the first part of an associate degree. Requiring 18 credits, the program includes six courses that cover major topics, such as social media marketing, information technology concepts, the legal environment of business, and professional selling. Certificate students gain a versatile skill set applicable to many areas of business or to further academic study. The program serves the needs of working students, with a fully online delivery format and asynchronous courses that enable distance learners to complete assignments at their own pace. NCC is regionally accredited by the Higher Learning Commission (HLC). Normandale business programs are fully accredited by the Association of Collegiate Business Schools and Programs (ACBSP). One of the largest community colleges in Minnesota, NHCC also offers one of the best online marketing certificate programs in the state. The school's marketing and sales certificate builds a foundation in marketing along with general business skills, such as communication, teamwork, and leadership. Students also gain the specialized skills necessary to prepare market research data and analyze marketing communications. Requiring a total of 14 credits, the program includes four courses: consumer behavior, advertising and sales promotion, professional sales and management, and principles of marketing. While NHCC offers courses online, certificate candidates must complete a four-credit course on campus as part of a required residency component. Students can work with the college to determine the most convenient time to complete their residency requirement. All credits earned through the certificate apply to many of the school's associate degree programs, including the associate of applied science in marketing. NHCC is regionally accredited by the Higher Learning Commission (HLC). A two-year college in North Dakota, DCB offers an affordable, fully online marketing certificate for working students. The 31-credit advertising and marketing certificate trains students to develop consumer audiences and build relationships between businesses and consumers. The program requires two semesters to complete and includes a total of 11 courses, covering topics in management, entrepreneurship, public relations, business communications, and the principles of retailing. Certificate students often pursue entry-level positions in advertising, communications, publicity, fundraising, and a variety of other fields. Alternately, students can apply their credits toward DCB's associate of applied science in advertising and marketing, which requires just one additional year of coursework. DCB also maintains transfer agreements with many four-year colleges in the state, making it easy to move from the associate program into a bachelor's in business or marketing. DCB is regionally accredited by the Higher Learning Commission (HLC). Based in Bemidji, Minnesota, NTC provides professional and technical training to students of all backgrounds, including two online sales and marketing programs: an 18-credit certificate and a 32-credit diploma. The certificate trains students to devise and implement marketing strategies and prepare small business plans, equipping graduates with the skills needed for entry-level positions in the field. Students complete six courses, including principles of marketing, retail management, and e-marketing. The diploma features a more extensive curriculum, covering topics in business communications, advanced professional selling, and customer relations management. The program includes most certificate courses along with advanced courses, such as customer relations management and financial information for life. Students can apply credits earned in both the certificate and diploma programs toward NTC's associate of applied science in either business or sales marketing and management. NTC is regionally accredited by the Higher Learning Commission (HLC). This concentration introduces students to new technologies and approaches in the digital marketing space. Coursework covers topics like email marketing, marketing for mobile applications, search engine optimization, paid search marketing strategies, analytics, and social media marketing. After earning a digital marketing certificate online, graduates can assume entry-level roles in many industries. This concentration integrates foundational business topics into a more general marketing curriculum. For example, students may learn how to conduct market research to identify the appropriate price and distribution strategies for a particular good or service. In addition to entry-level jobs, this certificate can help prepare learners to pursue an undergraduate degree in business administration. Students taking the concentration develop marketing skills applicable to the nonprofit sector. They may learn how to engage volunteers, reach new audiences through fundraising appeals, and market their nonprofit's services to members of the community. Students also learn to leverage earned media and use low-cost marketing tools. The exact curriculum covered by a marketing certificate program varies depending on the school; however, the five classes listed below represent common foundational courses popular among these programs. In this course, students receive an overview of core marketing concepts. Specific topics may include buyer behavior, market segmentation, marketing and branding strategies, and services marketing. As learners explore these subjects they develop a basic understanding of exchange relationships and how these compare and contrast with communal relationships. Building on introductory coursework, students in this class examine the science of how consumers behave and how marketers can leverage an understanding of this behavior to better sell products or convey ideas. This course touches on subjects like memory and learning, social class and income, and cultural influences on consumer behavior. This communications class teaches students to ensure consistent messaging of an organization's brand across several channels by using various marketing tools and best practices. The internet represents the most powerful marketing platform in the modern world, and marketing professionals must understand its strengths and limitations to succeed. In this course, students explore internet revenue models, business-to-business and business-to-consumer digital marketing strategies, and methods to develop and maintain an effective web presence. This course serves as an introduction to global marketing for learners who aspire to work at an international company. Students learn how cultural differences affect marketing strategies, what laws and regulations shape the flow of information around the world, and how approaches to market segmentation and targeting differ in various regions. Many schools offer marketing certificate programs online, although the length of these programs varies. Generally speaking, programs consist of 10-15 credits, and most students can earn their certificate in about one year. Some programs feature self-paced classes that allow students to advance through course material once they demonstrate mastery of a particular subject. Students with previously completed college-level coursework in marketing or those who hold relevant professional experience can move through self-paced programs quickly to earn a certificate. However, before enrolling in a self-paced program, make sure to speak with an admissions counselor or faculty adviser. An adviser can offer guidance about managing stress and avoiding burnout when completing coursework at your own pace. Many students ultimately prefer learning alongside their fellow classmates rather than working through the material alone. Even the best online marketing certificate programs only prepare graduates for entry-level roles. Additionally, most jobs in marketing and communications require a bachelor's degree. However, this does not mean that a marketing diploma represents a bad investment. Beyond demonstrating your basic understanding of marketing practices, a certificate can also help you continue your education and earn a more advanced degree. Earning an online marketing certificate qualifies you to take on a junior position selling advertising space for a newspaper, website, or event venue. Alternatively, you can help manage the social media presence of a nonprofit organization or small business. Individuals who continue on and earn a bachelor's degree may ultimately qualify for marketing positions at larger companies. However, no matter what path you choose, jobs in marketing require strong analytical, communication, interpersonal, and organizational skills. Advertising sales agents arrange for the sale of advertising space in various forms of media. Most roles require at least a high school diploma, although coursework in marketing can give you a competitive advantage over other candidates. Marketing managers use their understanding of consumers to set prices, find new markets, and create promotional strategies. Most managers hold a bachelor's degree, and an online marketing certificate can help you work towards this requirement. Public relations specialists help organizations maintain a positive public image by working with members of the media or communicating directly with the public. These professionals typically need at least a bachelor's degree. By organizing events and campaigns, fundraisers help generate revenue and awareness for nonprofit organizations. Employers generally prefer to hire candidates with a bachelor's degree, although prior fundraising success may matter more than educational qualifications. Market research analysts study market data to learn more about what customers want and need. These analysts typically need to hold a bachelor's degree, and some positions even require a graduate degree. Students can often apply credits from online marketing courses towards a bachelor's degree, unlocking the potential for a significantly higher salary. For example, marketing managers -- who need to hold a bachelor's degree or higher -- earned a median salary of almost $130,000 in 2017. A bachelor's in marketing provides a deeper exploration of the subjects covered in a certificate program. These four-year programs typically feature general education coursework in addition to foundational classes in business administration. A bachelor's in advertising covers many of the same topics as a marketing degree, although it may also feature classes in advertising research and media planning. Students may also need to create an advertising portfolio. Undergraduate students majoring in public relations learn to use social media and work with traditional media outlets to maintain an organization's public image. Students often need to complete an internship or capstone project to demonstrate their understanding of key concepts. A bachelor's in communication prepares students for a variety of careers. For example, students interested in employee communication can pursue positions in human resources, while others can seek out jobs in the media. Students pursuing a bachelor's in journalism learn how to research, write, and edit news stories for various media outlets. Most journalism programs place a premium on professional ethics, requiring students to take multiple courses in this area. When choosing a certificate or diploma program, make sure to confirm that your school holds some form of accreditation. The accreditation process ensures that an institution meets certain academic standards and adequately prepares its students to join the workforce upon graduation. If your certificate program does not hold accreditation, you may encounter difficulties transferring credits to another institution. Additionally, students attending unaccredited schools may not qualify for certain types of financial aid. At the institutional level, colleges and universities can earn regional and national accreditation. Most nonprofit colleges and universities seek out regional accreditation, which tends to be more prestigious, whereas for-profit and vocational schools often receive national accreditation. Additionally, programs in a particular discipline, such as counseling or public affairs, may also receive accreditation from a group specializing in that subject area. Because of the field's close connection to business, marketing certificate programs can receive recognition from the Accreditation Council for Business Schools and Programs (ACBSP). The Council for Higher Education Accreditation's online directory of accredited institutions and programs makes it easy to determine whether or not your program holds regional, national, and/or ACBSP accreditation.